On June 25, Denis and I arrived at The Poisoned Pen early-- as usual-- and ran into two very familiar faces. The four of us have shown up to so many of the same author events that we're beginning to make plans to attend next year's Tucson Festival of Books together. They both raised their eyebrows at our attire. I was dressed in black, and I just smiled and said, "I felt like Johnny Cash today." (Cash being known as The Man in Black.) They both looked at Denis's bright Hawaiian print shirt and said, "Okay... then who's he? Don Ho?" We enjoyed chatting at the back of bookstore, but in no time at all, Linda Castillo, author of the Kate Burkholder mystery series, made her appearance. "Even my cover letter got rejected." Linda Castillo wrote her first book at the age of 13, and the plot involved two young girls running away from home on their Appaloosa horses. She found this first-ever book years later while rounding up items to take to Goodwill-- all the words contained in an eighth grade spiral notebook complete with a smudged hand print. Linda was born and raised in Ohio and later moved to the Dallas, Texas area to work in the regional offices of Domino's Pizza. In 1988 her writing became serious, and she wrote four books in a twelve-year period that were rejected by everyone she submitted them to. Once she even wrote a very nice cover letter to a publishing house, asking for their guidelines for submission. The publishing house sent a rejection letter in reply to her query. In 1999, Castillo began writing books for Harlequin Intrigue, but when Harlequin wanted her to stop killing people and to write less suspense and more relationships, Linda knew she was writing in the wrong genre. 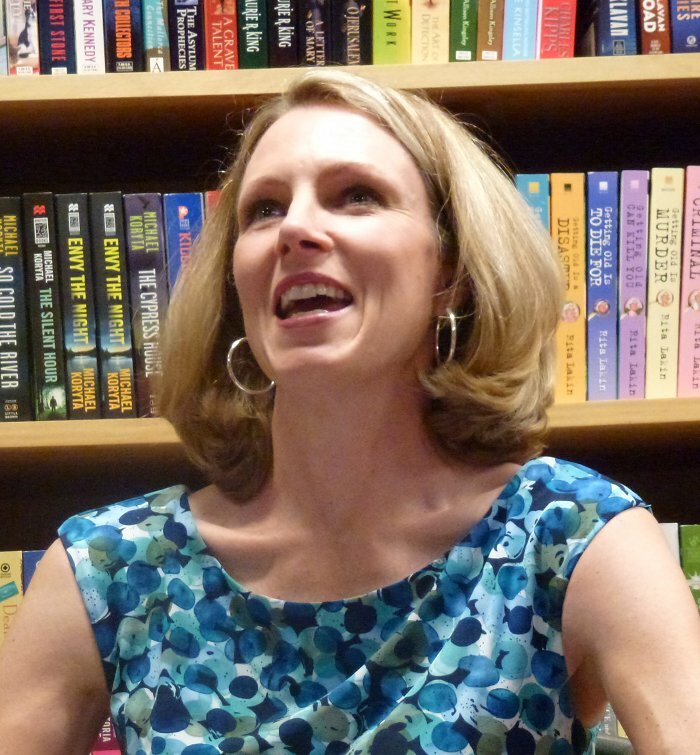 Since those early rejections, she's written twenty-seven books with three different publishers. In 2002, Linda began receiving fan mail from a man on trial for bludgeoning his wife to death while four of the five children were in the house. It seems this "gentleman" thought Linda would be the best choice to write his story. Linda has a difference of opinion about that, but didn't say anything about it until the man was convicted and sent to prison to serve a life sentence. You can read more about it on Linda's website. Castillo has gone back to Ohio Amish country to do research for her books. She's spoken to an Amish wife and mother (who had her last baby at the age of 47) who spoke to Linda in a nice but admonishing tone about the books. The father in a second Amish family is in a book club at his local library, and he loves the books. Reactions among the sect aren't always favorable, however. An Amish man in Wisconsin was so offended by Linda's book, Breaking Silence, that he burned it. In 2004, Linda Castillo found herself writing 8-10 hours per day, seven days per week. On Valentine's Day, she bought her Appaloosa named George, and George became her sole outlet from the world of words. She went on to buy a second Appaloosa named Missy. Missy has a future as a barrel racing horse, "but right now they're both out of shape," Linda admitted. Linda is a graduate of two citizens police academies in Plano and Allen, Texas. She's gone on ride-alongs with both male and female police officers, and she prefers the graveyard shift because "all the crazies come out at midnight." She's also gone through the "Shoot No Shoot" scenarios in which an instructor sets up a high risk, high tension crime scene, goes out to hand the participant a gun. The participant then kicks open the door, has a split second to assess the situation and then defuse it. Linda's Shoot No Shoot scenario? She kicked open the door to a women's restroom. A woman was on the floor. A man was straddling the woman, holding something in his hand above her. Linda took a look, and fired her weapon. "I shot a cop," she said. The thing that the man was holding above the woman was a badge. 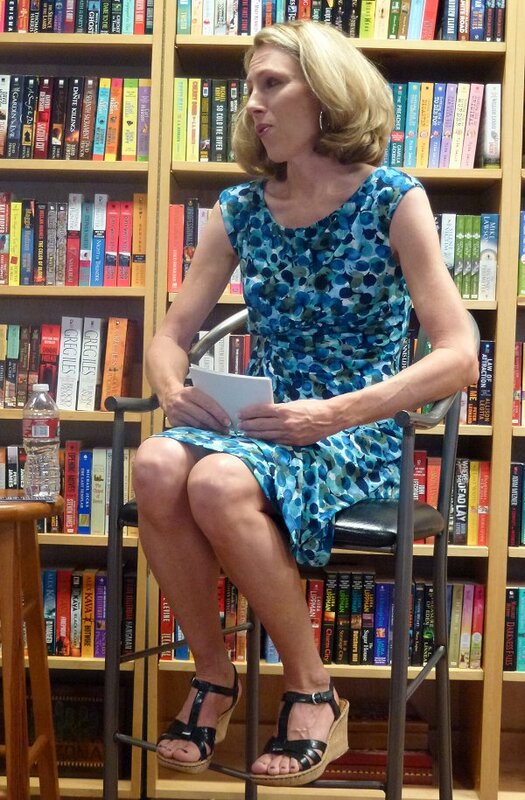 Right after this, Linda mentioned that her editor insisted that she tone down Kate Burkholder's drinking in the books. (Thank you!) All during the interview, I'd noticed a petite, dark-haired woman sitting in front of me who was intent on Linda's every word. When Linda mentioned her editor's advice, the woman nodded vigorously. Come to find out, the woman in the front row was a retired New York City police officer. She was in Brooklyn's first class of female cops to have the exact same job as the men. "I'm 5 foot 2, and back then I didn't even weigh 100 pounds," she said. "If I went out acting like the big hard guy, I would've been dead in five minutes. Go out and relax with the guys, yes. But we have to use our brains because we don't have the brawn." Linda first got the idea for the opening of her latest book, Her Last Breath, by traveling down a narrow, curvy road lined with overhanging trees. She soon came up behind an Amish horse and buggy. It wasn't long until a line of vehicles formed behind the buggy, and four cars behind Linda was a very impatient man in a little red sports car. With no concern for the safety of himself or others, he pulled out to pass, cursing loudly, his horn blaring, speeding around the curve. Not much was said about this latest book because it's so difficult to do so and not give away major plot points. Linda did mention the fact that the Amish are beginning to experience genetic problems. They do not marry outside their faith, and this greatly limits the gene pool. This does figure into Her Last Breath. Castillo corresponds with a woman who is no longer Amish. When Linda asked her what the best part of being Amish was, the woman told her, "The closeness of the families." 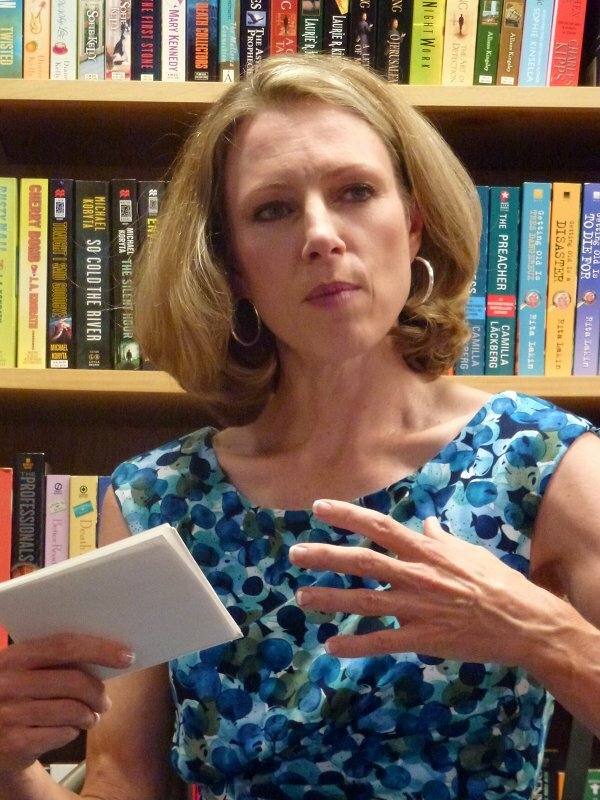 When asked if she wrote "by the seat of her pants" or if she was a plotter, Linda told us all that she definitely uses outlines in her writing process-- and she's about 250 pages into writing the next book in the Burkholder series. She also had some reading recommendations for us: Rage Against the Dying by Becky Masterson and Paul Doiron's Massacre Pond. It was hard to believe that time was up. Once again The Poisoned Pen had set the stage for an enjoyable evening with a very talented writer! It *is* nice to hear their stories-- and Denis and I are off to The Poisoned Pen to listen to Tim Hallinan's! What a great event! I really loved the Castillo book I read. I need to get back to that series. I have enjoyed this series and have a big case of envy..would have loved to have been at that event. Too bad I can't win the Lottery and charter a Poisoned Pen Plane for an event out here. I'd even make sure it was held during the winter! Thank you for sharing your visit with us. I enjoyed learning more about Linda. I am a fan of this series. This sounds like a fantastic event! I've gotten to know people by attending author events too. 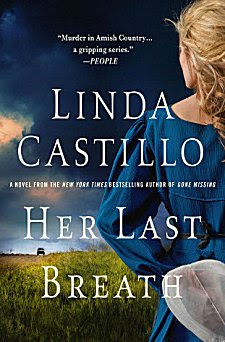 I just finished reading "Her Last Breath" and it was so good I could hardly put it down! The ending, Oh the ending - I was blown away!!!!! It is such a fantastic book, Bella! "all the words contained in an eighth grade spiral notebook complete with a smudged hand print." Wow. Shades of my childhood. I'm having flashbacks, lol! Sounds like a thoroughly enjoyable event. One of our local indie bookstores puts on author events, but most of the authors aren't ones I particularly want to go hear. It's great that you have a mystery bookstore nearby that brings in the right authors. Believe me, I know just how lucky I am-- and I'm thankful for it each and every day!